Do you have a library you want mentioned? Send it in! Today, let’s try the tip format. Don’t worry, we’ll introduce some nice modules along the way. ':' //# http://sambal.org/?p=1014 ; exec /usr/bin/env node "$0" "$@"
It works! Same behaviour as running node index.js Joe Jack. ':' //# http://sambal.org/?p=1014 ; exec `dirname $0`/node_modules/.bin/babel-node "$0" "$@"
Direct execution, not even needing a build step! Please note that the Babel team doesn’t endorse using this utility in production, but YMMV. ':' //# http://sambal.org/?p=1014 ; exec `dirname $0`/node_modules/.bin/ts-node "$0" "$@"
That’s all. Let’s start writing great Unix tools and utilities now! He also told me he was saddened by the news that Alex Young had stopped writing for DailyJS and is very eager to help create an alternative. So, with no further ado I will give the word to Offirmo. As you know, Unix programs can be run with “root privileges” usually by starting them with sudo. The “root” user has all permissions, which is in important security concern. You are not allowed to run this app with root permissions. You were root: privileges relinquished. In April I did a mention of React Storybook. If you are not familiar with Storybook yet, it provides you with an isolated environment to create your React components in. Over the past couple of months there has been a lot of development on the project, like patching bugs, adding features and one of the most amazing things about the new version is the add-on support. There have being a few add-ons created already, but today we will be having a quick look at the react-storybook-addon-info. 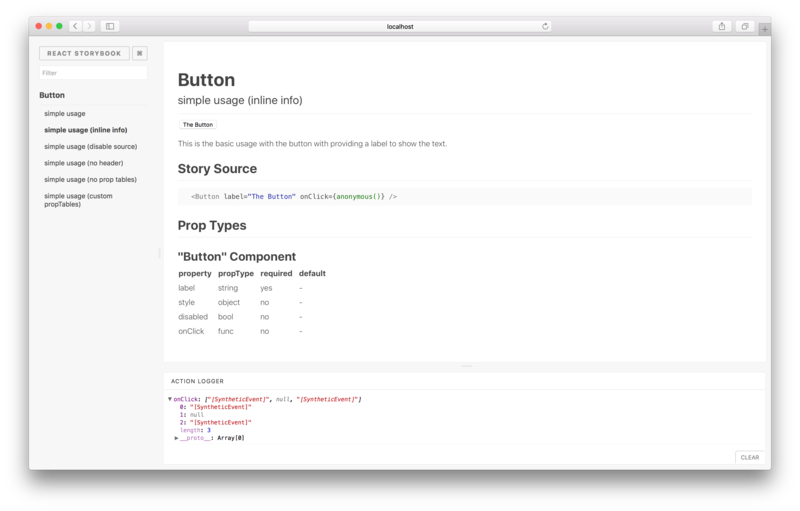 The info add-on let’s you use React Storybook as a living style guide with usage documentation. When using propTypes or defaultProps it will pick them up and present them in a table so you have an overview of whats possible with the component. Apollo Server is an easy to set up GraphQL server that works with all the major Node.js HTTP server frameworks: Connect, Express, hapi and Koa. Contrary to Facebook’s own express-graphql middleware, which serves mainly as a reference implementation, Apollo Server’s goal is to be a complete production-ready GraphQL server. In case you’re not familiar with GraphQL: GraphQL is a data query language created by Facebook that’s meant to solve the drawbacks of REST APIs. For a more in-depth introduction I recommend heading over to the GraphQL website. const myGraphQLSchema = // ... define or import your schema here! Apollo Server also comes with its own interactive, configurable in-browser GraphiQL IDE implementation that makes it easy to test your GraphiQL queries. For more on Apollo Server (and the complete Apollo Data Stack) and to learn how to run your own GraphQL server, head over to the website. I think that in all of us the curiosity grows which dependency is slower, so you might want to consider an alternative, dropping it all together or look for other ways of speeding up the installation process to in turn reduce the total build time. To give insight into which dependency is the bottleneck of your installation process Nolan Lawson created a very nice utility called slow-deps. slow-deps will take all your project dependencies, devDependencies and optionalDependencies and installs each one in a temporary directory with a temporary cache and measures the install time per package. Each dependency is then listed from slowest to fastest. For more documentation I would refer you to the Github repo. Note: I started asking for a bit more help with generating more content for this page. In the future you will be able to find tricks, tips and tutorials on this site as well. If you are interested in writing some content for this site please contact me with a pitch.